Apple rules the entire world today and tomorrow. Google wants to make sure you know they’re still around, and have announced a new Gmail UI for the iPad. Get the info here. f u cn rd ths, thn y th fk dyu nd vwls? 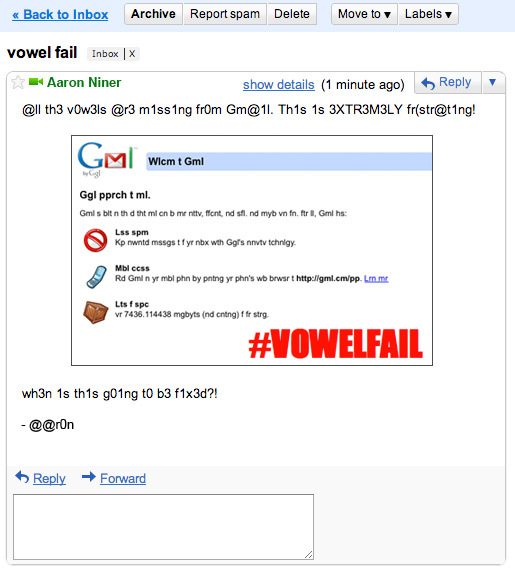 GMail’s playing a prank apparently there’s a vowel shortage in MountainView, so if you can spare a cup or two, it’s most appreciative. Just in time for the Chinese apocalypse, Gmail has added features that alerts users when their account has been compromised. Where’s the feature that gives you access to the launch codes? Hmmmm? More stuff from Gmail blog, here. 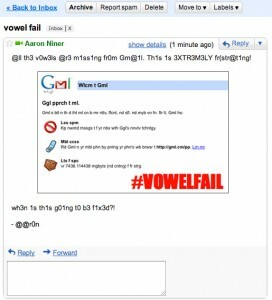 Apparently some people feel Gmail is slow at some points. I don’t know about that- I do acknowledge it acts strange sometimes, like (seemingly) all Google products are known to do. MG Siegler at TechCrunch says it mostly effects power users, and a fix is coming for that. He also says he is approaching 100% of capacity in his Gmail account. He’s filled 27.3 GB worth of mail? I won’t hit that until the Cubs win a World Series. More from MG down in Austin, hanging out at the “Gmail Behind The Scenes” panel. Six new features graduated from Gmail Labs, and another five have bought the farm. Get more details here. Speaking of Gmail, TechCrunch says some folks have been having Gmail issues today. Google will begin providing email service for Yale University, along with other tools like Google Calendar, Google Talk and Google Docs. 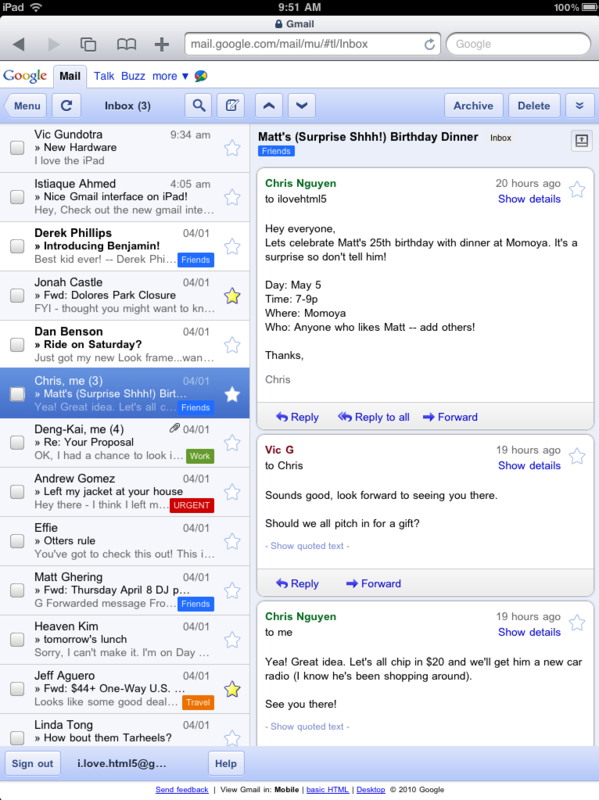 The mail UI will look just like Gmail, with no advertisements. You know that little Buzzy icon in Gmail? If you’re like me, you ignore it, or disable it. If you’d like to have a Facebook link inside Gmail, (this is a Chrome extension) Michael Arrington fills us in. First we had the Chinese hackers and Gmail, now the nutjob leader of Iran has decided to ban Gmail in his country. Users will have to use a “national email service.” No Google Buzz for them! More from WSJ here. Could Twitter be next? Google is going to roll out some type of new social media deal on Tuesday, that will integrate with “at least two existing Google products,” says TechCrunch. Google hasn’t become a monster in this field (can you say Orkut) as they have in others, so who knows? WSJ.com says Google is “taking a swipe at Facebook.” That’s all I could find there ’cause otherwise I’d have to <ahem> pay for a subscription, and that’s simply not going to happen. Why? One search, and I get a ton of hits. Looks like Gmail is the key to this one. The big reveal happens at 10am PT on Tuesday. Update: More quality info here. The author mentions the first thing I thought of when I saw the story- Google should just buy Twitter. What’s a couple of billion? Game over. 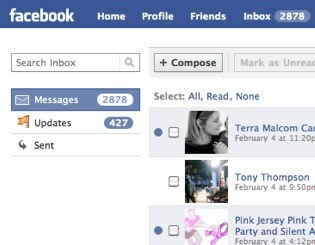 TechCrunch reports Facebook is about to get into the web-based email game.